Dell Inspiron i3542 11001BK is a low cost 15.6 inch touchscreen laptop as part of the Inspiron 15 3000 series with mid-range specs of an ultra low voltage Quarter 2 2014 release Haswell Intel i3 processor at 1.9GHz speed with no turbo boost that is certainly better than a lot of Celeron’s or AMD processor, large storage space, Intel HD 4400 for decent multimedia and some basic gaming, good number of connectivity options including a USB 3.0 port, an HDMI port, a DVD optical drive and more at a reasonable price. Dell Inspiron I3542 is offered with the 4th generation dual core Intel i3-4030U processor (3MB cache) at 1.9GHz speed without turbo boost but hyper threading so dual cores can handle four threads in parallel, 4GB DDR3L SDRAM (expandable up to 8GB), 750GB Serial ATA hard drive at 5400rpm as ample storage space and average read/write times and Windows 8.1 64 bit operating system as a stable platform for internet stuff, Word, Excel, multimedia tasks and gaming. It offers good performance and multitasking capabilities overall as the Intel i3-4030U has a Passmark benchmark score of 2706 at the time of this review and the Thermal Design Power- TDP of 15 watts help with battery life. 15.6 inch high definition touchscreen LED backlit capacitive touchscreen display with 1366 x 768 pixel resolution offers lush visuals- clear picture with rich details. 1.0MP TrueVision high-definition webcam with built-in digital microphone is a nice quality one and is good for chats with friends and family. Waves MaxxAudio 4 technology and stereo speakers for clear and immersive sound when you’re listening to songs, watching movies or playing games. This is not a major gaming laptop as such but the powerful CPU and the attached Intel HD 4400 GPU that is up to 30% faster than the Intel HD 4000 are good for light gaming- older titles like Minecraft, Tomb Raider and World of Warcraft can be played with no problems at reasonable settings. 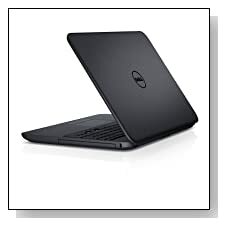 Dell Inspiron i3542-11001BK weighs 5.32 pounds with measurements 10.50 x 15 x 1 inches- offering reasonable portability with average weight and thickness. 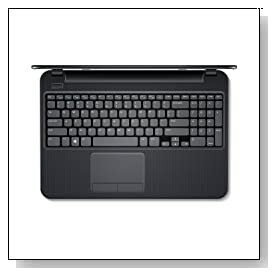 It has a basic keyboard with a numeric keypad and a functional enough touchpad with separate left and right clicks. Connectivity options include the regular but fast enough 802.11bgn WiFi wireless, Bluetooth 4.0 to connect with other Bluetooth enabled devices like your smart phone, speakers or printers, 10/100 Ethernet LAN with RJ-45, Multiformat DVD±RW/CD-RW drive with double-layer support for watching movies and installing software from DVD’s, an HDMI output to let you connect the PC to a large screen HDTV via one HDMI cable for sound and video, Multiformat Media Card Reader that supports SD, SDHC and SDXC formats, a USB 3.0 port that enables faster digital multimedia and data transfer and 2 x USB 2.0 ports. Conclusion: Dell Inspiron I3542-11001BK is a basic but reasonably solid laptop with adequate power, performance and features for work and play, office and multimedia tasks at a low price. 4GB RAM may appear small at first but not really and can always be upgraded to a max of 8GB if you are going to be needing more to be able to work on more demanding tasks, by removing the old module as there is only a single SODIMM available. Intel HD 4400 is equal to the discrete Radeon HD 7550M graphics and performs a little less than Intel HD 5000 but about 20-30 percent more than 4000. 750GB hard drive is 50% more than the amount you will find on the regular 500GB hard drives but the 5400rpm is not as fast as the 7200rpm and certainly not SSDs and it shouldn’t be so hard replacing the HDD with an SSD if you prefer speed over size and you can save your files on an external hard drive. It should offer you around 4 hours of battery life on average use so in terms of portability, size and weight it is like a regular 15.6 inch laptop. It offers relatively good value for money for basic and moderately demanding tasks and multitasking at a reasonable price.